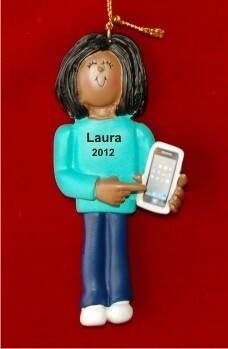 For the young lady who has a new phone and knows how to use it, we offer a really cute gift idea, the African American female with smart phone personalized Christmas ornament from Russell Rhodes. These African American kids ornaments personalized to be special keepsakes feature her name and the year on the front, and we'll add your extra message on the back at your option below. The female with smart phone Christmas ornament personalized for her also makes a great gift topper when there's a new phone inside! For First Apple Dec 28, 2014 Beverly S.